With regards to flexible packaging design, an “anti static” bag is any bag made with anti static polymers so that when it rubs or touches other materials it does not create static.. Essentially, an anti static bag prevents itself from holding charge. Since it is not holding a charge, it cannot release charge as electrostatic discharges (ESD) when it is laying on a grounded surface. The term “anti static” refers to the upper static dissipative range- usually defined as between 1 x 1010 and less than 1 x 1012 ohms / square. Polyethylene and polyesters used in bags for static control are always in this “anti static” range. Commonly anti static bags are tinted (usually pink or blue) and made of a single layer of polyethylene (PE) with static dissipative coatings sputtered onto them. These bags do not stop ESD, but they prevent the build-up of static charges on their surfaces that precedes ESD. 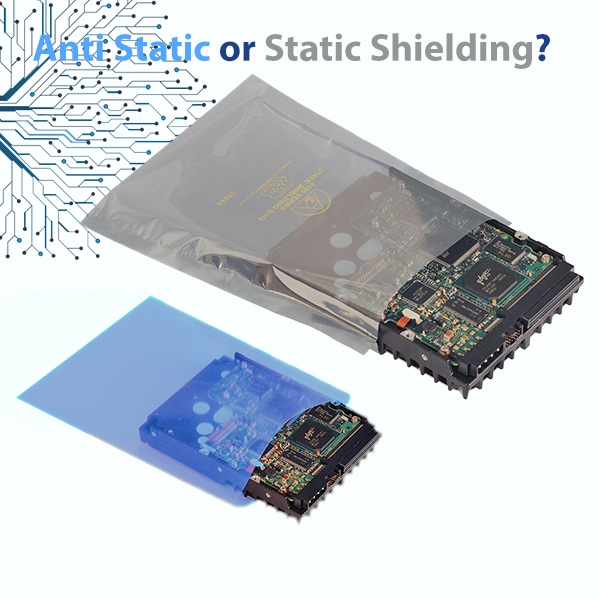 Whether an anti static bag is “static shielding” depends upon whether it incorporates conductive materials, like aluminum or carbon, into its design. A static shielding bag presents a conductive barrier to ESD in addition to allowing charges to dissipate off it. “Static Shielding” as a term usually refers to bags that use aluminum. This gives the bags a silver transparent sheen. Elimstat Shielding Bags are “Metal-In” – made with the conductive aluminum layer buried between two antistatic layers. Bags can also be constructed “metal-out”. Polyester with a thin layer of aluminum sputtered onto its surface is laminated to anti-static polyethylene. The resulting structure can be used to make a bag that forms a Faraday cage around ESD sensitive electronics and is heat sealable. The material is translucent allowing the contents of the packaging, including barcodes, to be read through the bag. Article Headline: Anti Static Bags and Static Shielding Bags Article Description: How to choose to buy Anti Static Bags or Static Shielding ESD Bags. Next post: How Do ESD Air Ionizers Work?